MADE ENTIRELY IN THE USA - Our patented Precision Pour measured liquor pourers are manufactured 100% in the USA. BPA FREE. 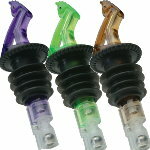 NO CRACKS, NO LEAKS, NO GLUE - like you get with cheap import pourers. Precision Pour gives you a precise, consistent pour every time from a quality, American product. 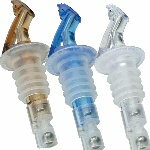 PROFIT INCREASES - Stop pouring out your profits with free-flow pourers that destroy your margins. 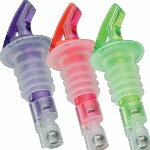 Our customers see an average of 2 to 4 extra drinks per bottle using our liquor pour spouts. Increase your bar profits now with Precision Pour bar accessories. 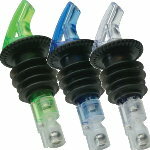 CONSISTENT ACCURATE POURING - Precision Pourers are the most accurate measured pour spout in the world. Period. Our numerous patents continue to lead this industry forward allowing professional bartenders to get rid of the bar jigger for good. MADE WITH VIRGIN PLASTIC - Our liquor pourers are made with quality plastic that won’t dissolve in alcohol like those cheap, foreign imposters. FITS STANDARD 750ml AND 1LTR BOTTLES - Fits snugly on standard 750ml liqour bottles and wine bottles to ensure each individual pour measures the perfect amount of liquid every single time. Talk about a great shot dispenser! Measured wine pour? No Problem! 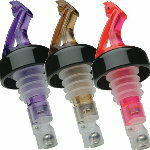 Precision Pour Measured Pourers are specifically designed to pour alcohol, wine and spirits only.